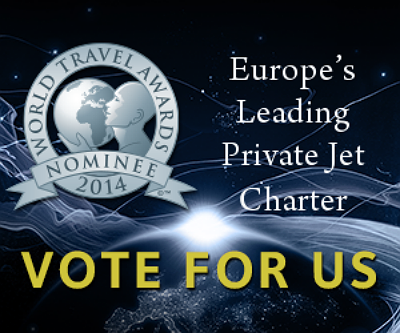 We are pleased to have been announced by the World Travel Awards as prime contenders for ‘Europe’s Leading Private Jet Charter’ provider 2014 and voting is now open. The World Travel Awards was established in 1993 to acknowledge, reward and celebrate excellence across all sectors of the tourism industry. The WTA brand is recognised globally as the ultimate hallmark of quality, with winners setting the benchmark to which all others aspire. The closing date for voting is the 23rd June 2014 and the winner will be announced shortly after this date. The winner of ‘Europe’s Leading Private Jet Charter 2014’ will be the company with the most votes – In 2013, over 500,000 individual votes were cast by travel professionals and high-end tourism consumers. The Skytime team have their fingers crossed!